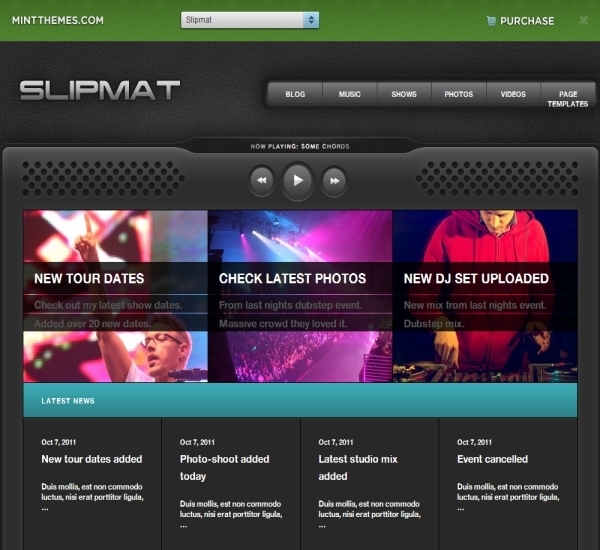 The Slipmat theme offered by Mint Themes club is specially designed for DJs. It is a music related theme packed with numerous music related features which will help you make a great musical website with features like streaming videos, MP3s, photos, photo albums, and much more. Most of the features are customizable so working with the theme will be very easy both for the advanced level developers and the beginners. The user guide and documentation is of great help to the users especially the beginners. In these documentations, they will find detailed instructions on how to use the theme and its various features in their project. This WordPress theme offers seven wonderful page template namely the general posts, videos, photo gallery, full width, media, shows, and so on. Three custom widgets are available with this theme. The users will find four different custom post types namely the photos, videos, albums or discography, and shows. The theme option panel gives users full control over logo, colour, site background, in-built page templates, custom menu integration, and much more. The option panel allows users to create designer website using the custom fonts, custom colour options, and many more customizable features. You will find a very powerful and useful drag and down menu feature present in this theme. With this feature, users will be able to include many options and their visitors will simply have to click on the drop arrow to select their choice. Moreover, no coding skills are required for performing using this feature. This feature is provided so that you can maintain your website’s branding with ease by making use of the logo uploader feature. It allows you to upload and store multiple logos and use them whenever you require. The homepage option allows for featured image display thereby making your website look more attractive. The PSD design files which are provided with this theme are organized in a proper manner. The in-built music player feature supported by this theme will allow your website visitors to listen to non-stop music. This music player is placed on the header section of every page. You can play videos, MP3, photos, and much more directly from the website. The links downloading feature is fully customizable and can be hooked to SoundCloud, iTunes, BeatPort or some third party music service provider. The SEO friendly feature will help in grabbing web traffic to your website as well as increasing its search engine ranking. The cost of this theme is quiet reasonable as compared to the number of features offered by it. The theme documentation and customer support is reliable and solves most of the designing problems that come your way. Loading speed is not very good when the when large amount of data, files, images, and other information is kept. Moreover, the cost of this theme is high as compared to its other competitor themes.